Broadbridge Heath boss Steve Painter. Picture by Steve Robards. The Bears are currently on a six game unbeaten run and sit sixth following their goalless draw at third-placed Newhaven on Saturday. Heath have 54 points from 33 games, the biggest points haul in the club’s history in Sussex’s top-flight. 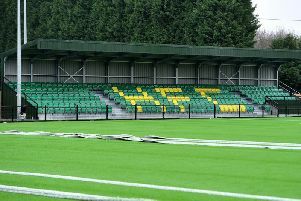 This, along with moving into their long-awaited new ground next season, has given the Bears boss ‘a new lease of life’. He said: “At the moment I’m confident of beating anybody in that league. It might sound arrogant but it’s not. “This is probably the most enjoyable season I’ve had with a group of players in a long while. “This group of players have been around the block. If you talk to them and ask them to do something they fully understand what you want. "I’ve always said, and it’s quite ironic because it’s quite surreal, since I’ve joined the club nearly ten years ago that it would be great if we got Jamie Taylor and Lee Carney back together to play at the back-end of their careers. "We never thought it would ever happen, but we did manage to do it. “You don’t really need to direct people like Lee and Jamie. They’ve been around the block longer than I have at the top level. "But we’ve also got around those two people like Kieron Thorp in goal, Devon Fender still, Georgie Cousins. "We’ve got some really good footballers. Bringing Ollie Moore back was big for us, and we’ve had Dean Wright come back. “They are easy to manage. Lee, Tom Bold, people like that, have been a Godsend. “In terms of training they take on extra responsibility and the whole club is absolutely buzzing. SEE ALSO Sussex football hotshots: Who are the county's top scorers this season? | SCFL chairman Nealgrove backs sin bins as ‘positive step forward’ to cut out dissent | Can you spot anyone you know in our Broadbridge Heath v Eastbourne Town picture special? "We’ve also added into the club people like Mason Doughty and he played in our under-18s years ago. "We are all of a sudden an attractive proposition again for young players. “The whole club is bouncing and these players have given me a new lease of life. For all their improvement, Painter did point out that not moving into their new surroundings had left him ‘disappointed’. Delays have seen the Bears remain at Broadbridge Heath Leisure Centre but Painter hailed his players for keeping him motivated throughout a difficult time at the club. 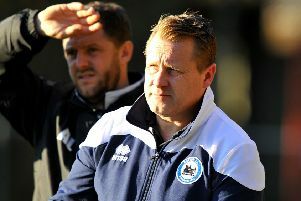 He added: “It’s been a disappointment for me as, if we’d been in the new ground we could have really kicked on this season. “I’m really looking forward to next season now because this group of players really want to stay together. “I’ve been promising lads for the past three years that we will be going into a new ground. “You can imagine players’ disappointment when they ask me, ‘when are we moving then?’. “I just avoid it now but I’m sure we will be in the new ground next season using the new pitches.